Built-in bread/storage shelf for easy access. 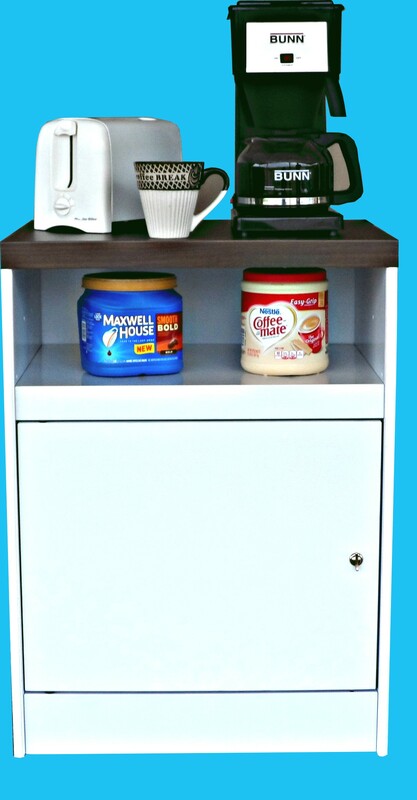 OCS 200 BS full-size home or office kitchen stand with built-in bread shelf. This handy stand is suitable for the home or office. It is packaged to ship UPS to save you money. This stand currently comes with a Walnut vinyl clad steel top and will look great anywhere. “Introductory Offer Pricing” Ask about free footies. Specifications: Top 23.25″ wide x 19″ deep x 32″ high. 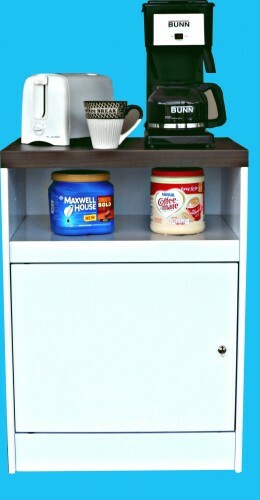 Cabinet 23.25″ wide x 17.5″ deep x 32 high, with shelf. This stand looks great in the glossy appliance white, but can also be ordered in a number of other colors as well. We include a choice of footies with every stand. One choice is hard rubber for non-slip floor protection. The other is Teflon for easy slide and move. You choose which you prefer and just stick them on each corner of the bottom. All State Manufacturing Company products are U.S.A. made with double wall steel construction. We are very proud of our stand and cart selection for home or office. They will hold up under years of heavy use and look great doing it. Our new packaging for UPS shipping makes our pre-assembled stands even more affordable.